Red crib bedding sets are very popular during the holidays. I admire the mother who takes time out of her busy life to decorate her baby’s nursery according to the changing seasons or for special days on the calendar. This color combination is refreshing and modern as it gets. Many parents like the idea of a monochromatic nursery with bold graphics that are more clearly seen by infants whose vision is not fully developed. Baby bedding in black and white stripes or polka dots looks fantastic when paired with modern collections of contemporary nursery furniture in shiny black. Let the black and white baby nursery color scheme rule the room with pops of red for the best results. The Secret Garden baby bedding collection comes with a beautiful garden print featuring dragonflies and butterflies in shades of red, olive green and cream. Nursery accessories include a matching nursery lamp with a scalloped, red gingham print lamp shade, crib mobile, diaper stacker, crib sheets, wall hangings and even a cute nursery rocker that is upholstered in fabric that matches the rest of the decorations. See more red, black and white baby rockstar nursery ideas here. I’m certainly in favor of novelty fabric prints and patterns slipped into the nursery’s decor covered in candy canes, Christmas trees and pictures of Santa Claus wearing the classic red suit trimmed in fluffy, white fur. However, I would like to encourage parents not to limit the use of red baby bedding in your nursery design for the month of December alone. 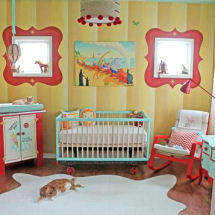 Red crib bedding in toile print fabrics is one of the more traditional and elegant ways to use red in the baby’s room. The children’s designs printed in red on a background of cream, ivory or antique white are not as bold as other fabric patterns using various shades of red. Plus, it’s very easy to pull in cool tones as accent colors in the rest of the room to balance the color scheme and quiet the atmosphere. There is nothing wrong with showing some support for our country with a set of patriotic red crib bedding. Arrange the colors in strengths to your satisfaction. Red crib bedding sets will shine brightly against a wall painted navy blue with white stars stenciled as a border or scattered in random sizes and locations. Bandana prints with black paisley designs solid red baby boy bedding works well in a western nursery design. Wooden walls, iron horseshoes, hats and boots will take some of the punch out of the bright red comforter. Repeat the fabric of the red crib bedding set in the handkerchief nursery window valance and red crib bed skirt for a custom look beyond compare. I hope that you experiment with our decorating ideas and tips for using shades of red in your baby’s nursery as well as in many popular nursery themes. I truly believe that it would be a shame to limit the enjoyment of red bedding and decorations in our homes to one or two months of the year. Please visit Unique Baby Gear Ideas again soon to find the latest in red nursery decorating ideas and tips for painting and decorating your baby's nursery in red. 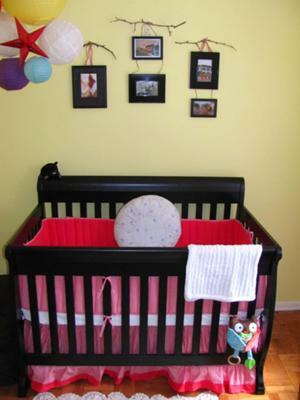 Do you have a great set of baby bedding or a picture of a nursery that you decorated in a red color scheme? Share it!